projections as to facilitate as much dynamic interchange with this soil biology. These edge enhancing roots create a durable anchor for the tree. This creates a stable and abundant environment so that the pulsating forces of wind, humidity, and temperature are moderated in the overall organism. This combination and reflection of the core model gives so many yields to nature and humanity. Through this dendritic pattern we can learn so much about how materials can be moved and how nature facilitates exchange that creates a fractal with other patterns such as the sinuous pattern and its employment of the run, riffle pool, sequence. carbon cycle which builds organic matter and weathering processes which create sand, silts, and clays. As water falls in watersheds, the highlands landscape picks up the water and these associated materials and funnels them through the dendritic pattern into its small capillaries and down into its veins for this exchange. As it does this, ordering of streams can be seen, which is pictured in the slide above in the picture above left. In the highlands, first order streams are created and as they cascade downward they confluence and build second order streams. When two second order streams come together a third order stream is built. This sequence combines to form the the trunk or main river as it gets to the lowlands. An example is the river I grew up on and is one of the great rivers of North America called the Ohio. Its inception is in Pittsburg, Pennsylvania known as the three rivers city. There two forth order rivers combine (Allegheny and Monongahela) in a confluence and form the Ohio , which then snakes down through the midwest and south eventually hitting the Mississippi at the once famous and now small town of New Madrid (flattened in the prophecized earthquake in late 1811 by Tecumseh). The Confluence of two fourth order rivers forming the Ohio. The Mississippi River, like the image of the Nile River Delta in the first slide picture above right, eventually fans out and once created a delta. This delta no longer exists because of anti-pattern hydrology where channels and levy’s where created to contain the river so agriculture could be expanded in the flood plains and transport be facilitated. This delta at one time facilitated the building of coastline and edge habitat through deposition of dislodged materials in the estuary and made an extremely productive ecosystem that a very unique culture of Europeans thrived upon after the conquest of the Natives who once inhabited the area. They are the Creole people of French and Spanish descent and the culture is eroding just as the coastline. Also the trunk, the Mississipi River, when given the chance to flow naturally was flooding on occasion thus creating fantastic soils through huge pool formation and fluvial deposition that was an inundation on normally dry land. This was helping to also cleanse the water and with these two filtering mechanisms removed by water engineers, flooding on epic proportions occurs from time to time as well as toxic pollution. Now a vast quantity of pollution from agriculture and industry runs off unfiltered through the mouth of the Mississippi out to sea where it forms the Gulf Dead Zone. The core model reflection of the highlands was removed as the delta was wiped out thus creating huge amounts of entropy. The Nile once did this yearly renewal of soils through seasonal flooding, which helped to build one of the most sophisticated societies we have ever known. In a vast basin in Africa, the Blue Nile is formed in the highlands of Volcanic based soils which through erosion brings mineral rich silts. The White Nile is formed out of Lake Victoria and all of its small tributaries and the flows North through a rich wetland (Sudd Marshes in Southern Sudan), which brought the organic matter from these edge enriched ecosystems. They would combine to form the Nile that we know and would flow in a sinuous pattern within the dendritic pattern which linked directly to the building of soils, an agrarian society, and a culture that was seemingly connected to energies from above that we cant seem to access anymore in the West. to decoding pools in our bodies like our brains and hearts so that our perception of our world around us in not just through one element. It fans out in dendrites and concentrates into main bodies, trunks and large rivers, and zips along to these concentration points. 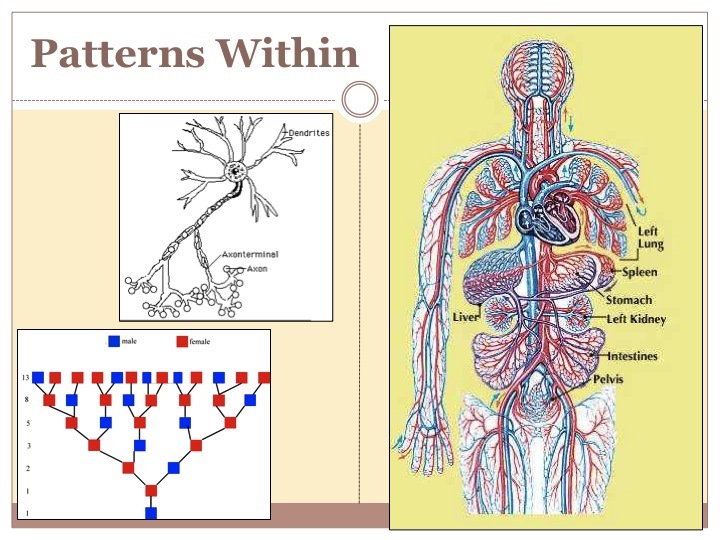 Similarly our river system of our body, the circulation system, is ingeniously created through this pattern. Studying that alone is a work of art that Da Vinci helped to bring forth and even the huge success of the museum exposition known as Bodies some years ago shows the allure of functional and natural patterns. When an artery gets blocked, this transference can no longer occur. This is analogous to the dams being built on Nile and locks and levy’s on the Mississippi. The result is a decline of ecosystems around and the cultures that depend on them. The Nile was dammed for irrigation for agriculture because we had lost our recognition of the significance of the patterns of nature through our dualistic and material based thinking. Now this once productive drylands area is now a desert mainly in the name of cheap clothing as cotton was the main production focus as the dams served as water storage for irrigation. If we realize these natural patterns were beset upon us for a reason, then we can enliven them and bring forth the abundance that nature inherently provides. Exponentially ecosystems can rebound which the Fibonacci sequence demonstrates. This sequence of sacred geometry is also tied to the dendritic pattern as populations build on a bell curve not on a linear model. 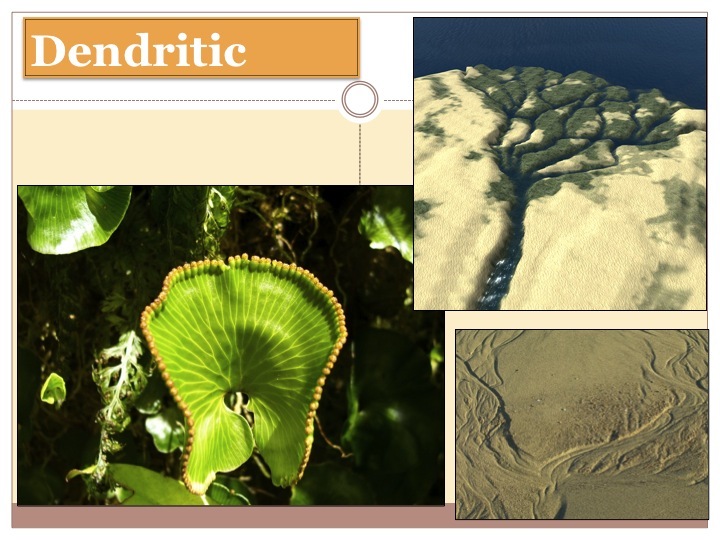 The slide above with picture below left shows this and marks the ability for nature to move in exponential factors, both in decline and in regeneration depending on our approach. localized planning that would keep character and facilitate the necessary flows of cities. Analogous to channeling streamways that were once sinuous and moving concurrently with the dendritic pattern, the run, riffle pool sequence is phased out creating stagnation from the lack of diversity. Traffic builds, pollution concentrates, stormwater runoff is problematic, and long and wasteful commutes become inherent yet other models could be present. The gridlock of New York City, NY, USA can be seen in the slide above on the right. The straight lines create this nightmare while even along the sinuous Columbia River in Portland, Oregon, USA on the above left picture, the Roman Grid was simply installed with no foresight. 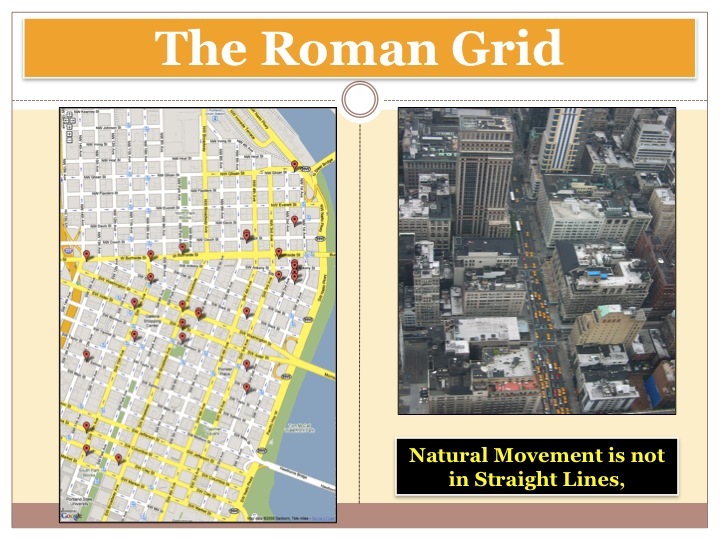 The Roman grid, being a military tactic, facilitates the control of a mob (group of people). In this modern context, it reinforces the idea of each person having their own house, their own car, their own tools, their own TV, and their own disconnected life. One that is bereft with confusion and stress due to the lack of community. Community seems to pop up more at shopping malls and bars than anywhere else, which further perpetuates cycles of erosion through consumption. 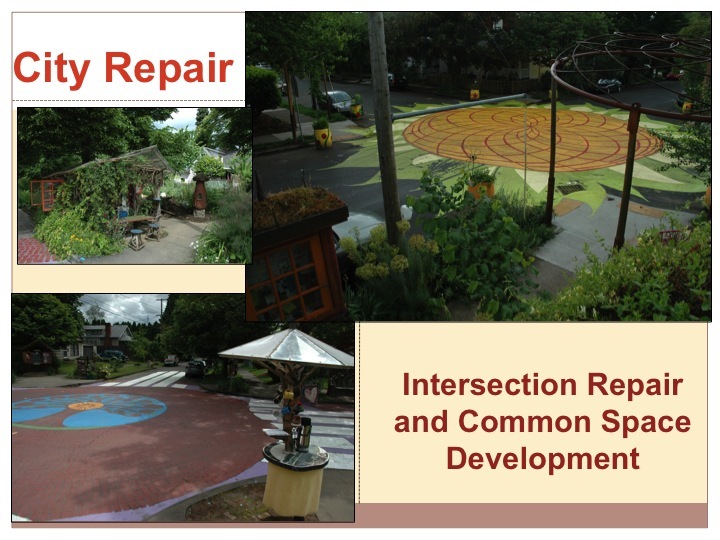 remarkable work of an organization called City Repair there in Portland, groups of people can apply for an Intersection Repair and Common Space Development Permit. They paint the pattern, do the creative edge work with chai stands and kids cob book exchanges and the like, and they can have block parties with advanced notice to the authorities. All of these facilitate pools of energy where ideas can be exchanged, fun can be had, and social interaction in general facilitated in a local vicinity without a direct need of consumption. They are truly wonderful sights dotted across the urban landscape in residential areas and put quite a smile on my face when biking through them in my West Coast travels and work in 2008. Thus the straight lines of the grid, which create runs and riffles were offset with these pools bringing a natural order through confluences of local streams of people. credible solutions rather than gloom predictions and fear creation. 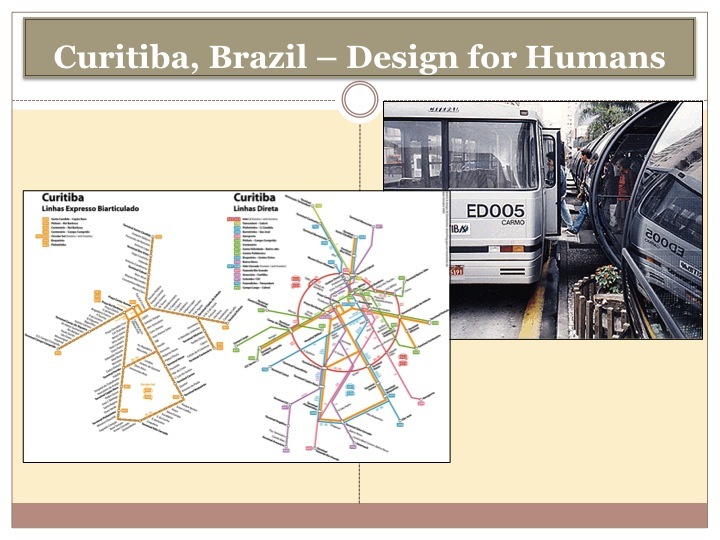 What Curitiba did with that mantra was laid out the basic flows of the city and destroyed the idea of planning based on industrial, residential and commercial zoning separation. This was the case of my hometown of Cincinnati, Ohio, USA, which is now reverting to this mixed zoning that Curitiba has long employed. Quality of life is rumored to be quite high because the city thrives in part through the lack of long commutes yet efficient transport. Their buses have top priority and their stations are set up more like tube stations with already pre-purchased tickets for rapid loading and movement. In rush hour times in some locations, buses come as often as one every minute as to move the population around in these shorter distances, which radiate outwardly much more like a dendritic pattern than the Roman grid. Buses are given priority over cars and the city aims to make movement easy and efficient. Unlike Barcelona, Spain with the advent of the car and facism, the planners there did not elect to implement such a design and simply laid the Roman grid on the outskirts of the old town. However, the Curitiba developers relied on patterns and focused strongly on inputs and output relationships. Another demonstration of their alternative perspective is the strong focus on greenspaces and their management. In such a humid climate, the grass grows rapidly and needs cut often. They, however, elected to employ sheep rather than lawnmowers which are strict consumers. 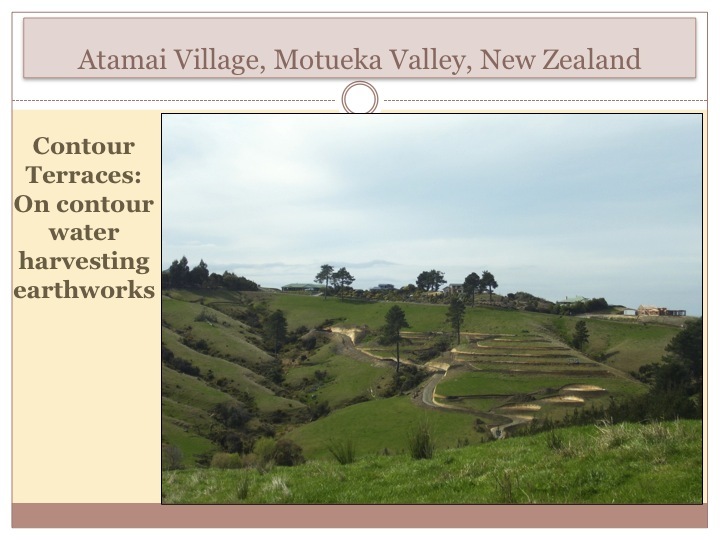 ecovillage that I took part in design work and extensive tree planting, these contour terraces work with the idea of the dendritic pattern but flip it. It is easy to see how regeneration occurs quickly in valleys in this picture because waters’ concentration there. However in sloping landscapes, ridges dominate the total area and need a focus on rehydration for regeneration. Thus we can use contour and the keyline pattern to redistribute the surplus water back out to the ridge part of the landscape and accelerate succession and evolution of regeneration landscape wide. 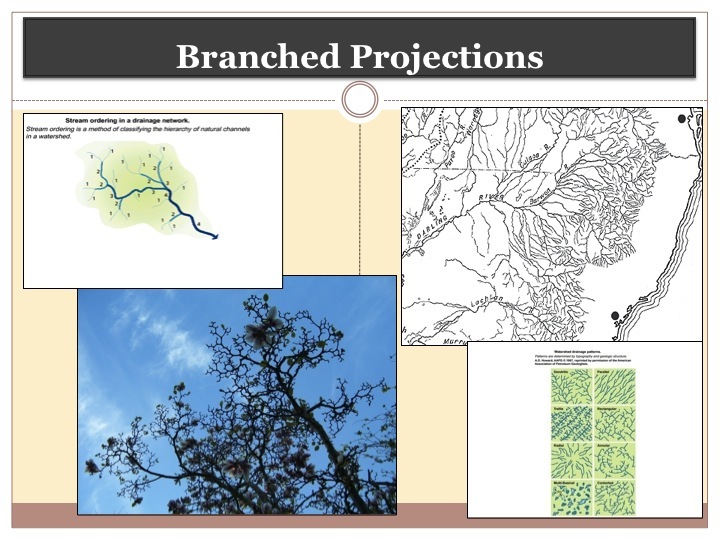 Through this application we can reverse the half hydrological cycle and the flood and drought syndrome that follows closely behind it and its cascading degenerative effects. It is through pattern application that we can solve so many of the worlds problems as natures workings can guide us towards abundance.